His kidnapping ordeal leaves Hakeem with mild PTSD and deepens the animosity between him and his parents. Lucious can’t stand to see Hakeem succeed without him because he thinks his son has to be at Empire in order to become a man, but his stint at Lyon Dynasty is making him grow up more than saying “Drip, Drop” while fake jet skiing ever could. 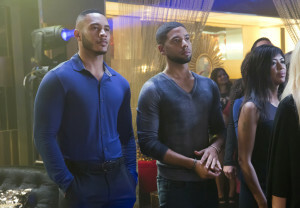 Trai Byers and Jussie Smollett in the “A High Hope For A Low Heaven” Cr: Chuck Hodes/FOX. Andre is settling into his new role at Empire as President of Gutter Life Records, which he thinks means firing everyone who has not accepted Jesus Christ as their Lord and Savior. Thankfully, his newfound judgy-wudgy behavior won’t impact the career of Freda Gatz. Lucious likes her too much because unlike his sons, she is actually from the streets and isn’t afraid to show it. Guest star Bre-Z in the “A High Hope For A Low Heaven” Cr: Chuck Hodes/FOX. Speaking of kicks to the face, Boo Boo Kitty is there for Hakeem when he needs her the most, even though she is a lonely, crying mess. When she pretties up and goes to visit him at his post-performance party with Mirage à Trois, he’s grateful but is still all like, “you can’t sit with us” and closes the door. They have finally made me feel sorry for Anika, which I thought was impossible. I also thought it was impossible to be angry with Cookie, but I most certainly am. I KNEW she should have been more cautious with her new out-of-thin-air security guard and I was right. I still think her checking him out just because he’s Hispanic would have been in character for her, but know we’ll have to wait and see what disaster Lucious has to save her from now. In spite of the plot holes you can drive a kidnapper’s van through, Empire still manages to be a quality show. 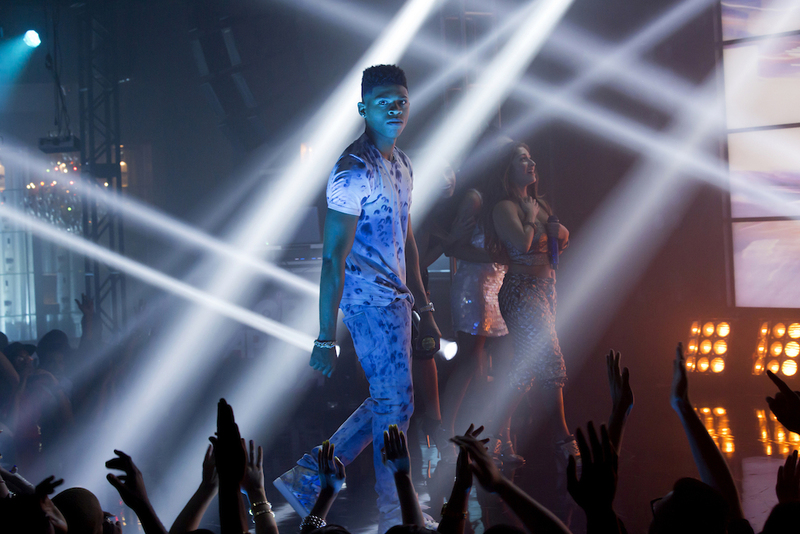 The audio-visual representation of Hakeem’s PTSD through his music has me thinking he is ready for an Emmy nomination. Despite his petulance, he has true talent and seeing his gift literally distorted after his trauma was heartbreaking. I also enjoyed seeing Jamal pour his heart out during “You Broke Love” with the approving reflection of his father’s face. The acting and production are top quality, even when the writing isn’t, and that is what will keep this show alive. One Tough Cookie: UP. Whether it be a high heel to the throat or a gun to the forehead, Cookie is not to be trifled with! Andre’s Ministry: And let the church say, Down. Getting baptized does not make you automatically know Bible verses or justify showing favoritism to a fornicator just because he has a Biblical name. Freda Gatz: She’s up, and you know it! I could listen to her rap/kick people all day. Lucious & Freda Gatz: Boom boom bang bang down down. I cannot get over the fact that she wouldn’t be an orphan if it weren’t for him. He doesn’t deserve to work with her. Hakeem can just decide to get out of the van before the driver gets the $40,000? Didn’t he get snatched in broad daylight before?